With Jared Cook demanding the WR tag, and under-performing to boot, drafting a tight end to help Jake Locker is a must. 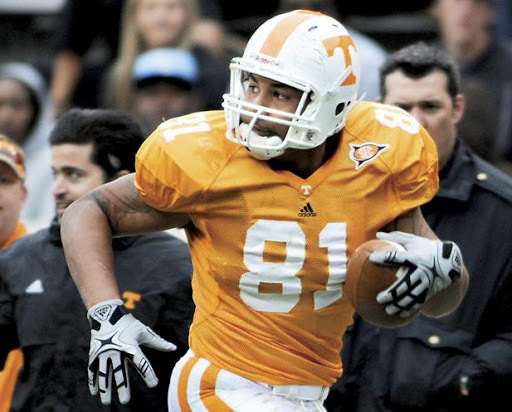 Call me a homer I don’t care but Mychal Rivera would be a perfect pick for the Titans. A bit undersized compared to other TE’s at 6′ 3″ and 242, Rivera is a powerful receiver with incredibly soft hands who generally catches everything thrown his way. Unfortunately, there weren’t enough targets to go around in 2012 with both Cordarelle Patterson and Justin Hunter in the receiving game. Still, Rivera managed to rack up 36 passes for 562 yards with 5 touchdowns. A late round prospect, he is a willing blocker who needs a little work but he would be a reliable target for Jake Locker.